In the destruction of medical waste, it is widely understood that the safest way to reliably and permanently destroy hazardous pathogens and germs is with heat. As manufacturers of the worlds most trusted range of medical incinerators, we are more than well aware of the risks and benefits associated with handling medical waste. In recent years a different approach to waste destruction has become popular and that is using an Autoclave. While not without its merit an autoclave can be very effective at treating a specific type of medical waste. However, the important question is what is the safest for the long term. An autoclave is a pressurised chamber that is used to sterlise waste at temperatures of approximately 129°C (249ºF). Operaring in a similar fashion to a traditional pressure cooker. They are used in many industries for a variety of uses not just for the destruction of waste. In the chemical industry, they are used to Vulcanize rubber as well as to manage hydrothermal synthesis. Although the autoclave may appear new to many people it has been in use for more than 100 years with the first recorded Autoclave, being produced in 1884 which in itself was an adaption of a Steam Digester which had been in use since 1679. Autoclaves are available in compact solutions that can be easily installed in most environments which have made them very popular in Microbiology, Podiatry, Tattooing, Body Piercing, Veterinary medicine, and dentistry. They are beneficial in the sterilzation of many materials as they operate on a non-destructive path which leaves many items able to be recycled and reused. Due to the more compact nature of an autoclave when they are being used for larger scale medical waste destruction they are required to be used alongside a biological shredder which cuts waste into smaller pieces to be able to be processed. When used correctly an autoclave and an Addfield incinerator are both equally safe to use. The autoclave benefits from operating similarly to a home cooker once the contents are loaded in a switched on. Addfield incinerators are fitted with advanced safety features and designed to reduce ambient heat generated making them more comfortable to operate. The weak point of the Autoclave operation appears when you consider that you will also be required to use an industrial waste shredder to initially reduce the composition of waste to be sterilised, adding the dangers of physical injury from using a shredder alongside the pathological, particulate risks associated with shredding infectious tissue. Incinerators do not require waste to be interfered with before loading which makes them a safer solution for maintaining complete biosecurity in operation. Mixed medical waste can take many forms, where an autoclave may be the ideal solution for sterilising medical tools and syringes when it comes to larger pathological waste it can struggle with the size. As it operates in the same principles of an advanced pressure cooker and waste needs to be reduced into smaller chunks for heating to prevent only the outside areas being sterlised. This is not ideal when dealing with a large biological matter such as body parts or organs. Viral infections can contaminate every cell in the infected matter when heated in an autoclave the material is sterilised externally however depending upon the density and temperature and time of the autoclave process the toxins and bacteria may simply be restricted rather than destroyed. Medical autoclaves typically process waste at 134ºC for three minutes or 121ºC for 15 minutes. This has been proven to be ineffective at completely destroying, Creutzfeld-Jakob disease more commonly known as CJD or can become active once more after being autoclaved within only 6 days. The sterilisation process uses 'damp heat' to treat the waste it is not recommended for some materials such as plastics and papers. An Addfield incinerator will initially heat waste to a minimum of 850º in the primary chamber where it will combust and reduce all the waste loaded into the. Following the primary chamber, the gasses will then travel into a secondary chamber where the gasses will be heated to a higher temperature of approximately 1100°C for a minimum of 2 seconds. At this temperature, any prions, toxins, odours and bacteria will be completely neutralised. Disposal of remnants of Medical Waste. 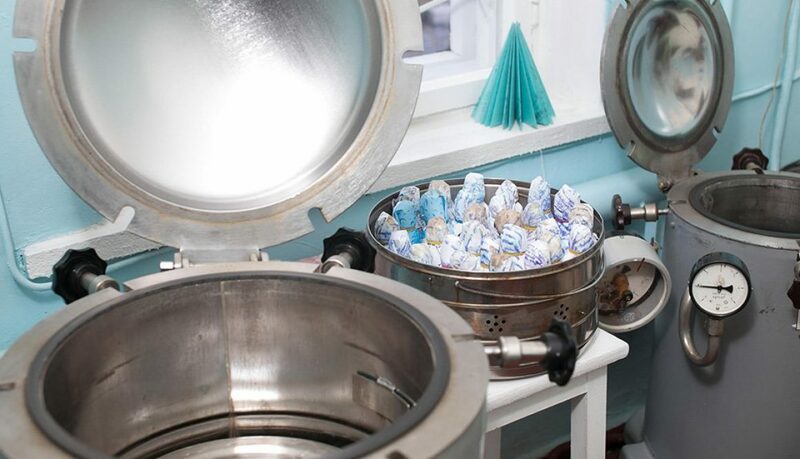 An autoclave only heats the materials that are placed inside it. It does not reduce the overall volume or mass of the waste. This will still leave you with the problem of having to dispose of the waste in a landfill or other means of removal. This is not ideal if the waste has not been completely sterilised of toxins such as CJD, which will simply hibernate in the ground before becoming a potential environmental hazard in years to come. An incinerator operates along the principals of destroying through burning which alongside safely neutralizing any hazards reduces the waste to dispose of by up to 97%. This is a much more manageable amount of waste which can easily be disposed of and in the most instance can be sent to landfill without requiring additional permits. 100 Kg of waste that has been Autoclaved will still leave you with approximately 100Kg of solid waste to dispose of. 100Kg of waste that has been incinerated will leave you with approximately 3Kg of ash to dispose of. As important today, as it will be in the future, is the environmental impact of operating an Autoclave versus an incinerator. An autoclave is powered purely by electricity which is often presented as a positive feature removing the need for fossil fuels. Unfortunately, the level of electricity required to operate a sterilisation process is quite considerable which reduces the benefits of being 'Carbon Neutral' as much of the available electricity is still created byfossili fuels. Being an electrically powered device also reduces the potential longevity of the Autoclave which relies more heavily on specialist parts to run and can become obsolete. In the UK and most of the EU an autoclave is only permitted to treat specific types of medical waste. As many developing countries are following guidelines and recommendations for the environment initially established by the EU it is very possible that in the near future the usage of Autoclaves for select waste will be strictly regulated. Incinerators unfailrly receive negative press due to the perceived negative effects of burning waste. Addfield incinerators are built alongside the most innovative approaches to incineration. Incorporating thickened steel alongside an advanced multi-layered refractory which have both been designed to reduce the operating costs by over 40%. A common concern of incineration is the creation of smoke and odours this is prevented through the the secondary chamber which heats the gasses to more that 1100ºC and only releases clean gasses back into the environment. Built robustly and designed to last for many year of hard usage it is not uncommon to achieve more than 20 years of usage from an Addfield incinerator, greatly reducing the impact of manufacturing when compared to using electronic devices. Incinerators are already heavily regulated along waste types and emmisions, having very strict enviornmental guidelines to operate along making them the ideal choice for long term operation. Autoclave is probably not the ideal solution for you. If you have a small Veterinary practice of Laboratory that an autoclave is probably the right solution for you. However, if you require a consistent destruction and removal of hazardous medical and pathological waste for many years to come the the sensible option for your and the next generation would be to select a high quality environmentally optimised Medical Incinerator such as those manufactured by Addfield. It’s that time of year again that our sales team pack their bags for a week away from the cold and wintery UK to spend a week in warm and sunny Dubai. Exhibiting from the 28th to the 31st January at one of the worlds largest and most respected medical exhibitions ‘Arab Health’. Our annual expedition to the Dubai World Trade Centre as one of the suppliers taking part in the UK pavilion organised by the ABHI all proudly flying the flag of the virtues of being made in Great Britain. Arab Health is always an amazing way to start the year giving us the opportunity to meet any number of the expected 84,500 visitors across the four days. As with every year we already have a full agenda with new and old customers booked in to see us during the event. Having a busy schedule before we even arrive it is useful that several of our international distributors are coming along to take their turns on the stand bringing with them their own customers alongside supporting us with new ones. Every year we have a lot of news to share with our customers at the show and this is no exception winning both the Chamber of Commerce award for International Trade alongside the Board of Trade award from the Department for International Trade, reinforcing our commitment to our international customers. 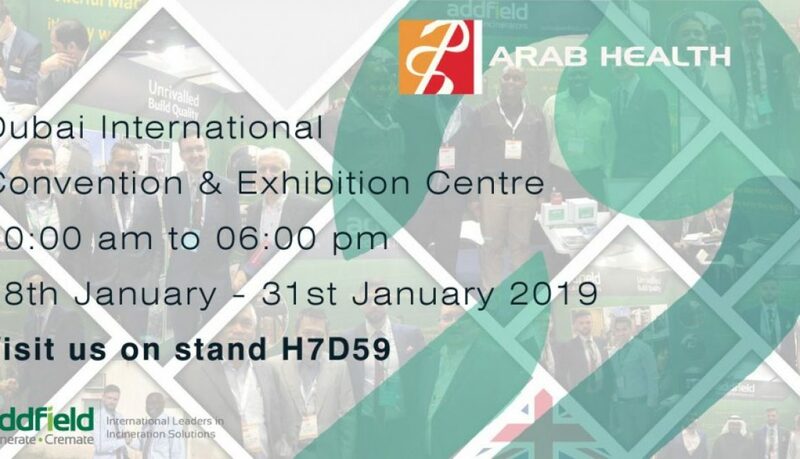 A lot has happened at Addfield in the past twelve months, and if you haven’t had the chance to catch up with us recently and are coming to Arab Health it is the perfect time for a review. This year we have even greater range of solutions for safely disposing of medical waste from less than 50kg an hour all the way up to more than 2 tonne, more than enough for every clinic, health centre and hospital. If you are coming to the show make sure you come and see one of our team on stand D59 in Hall 7 we still have some spaces available for meetings.